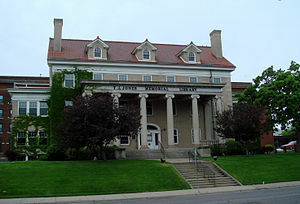 Jones Memorial Library, the prominent building of North Central University, faces Elliot Park. 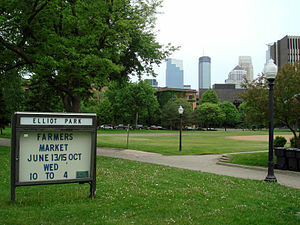 Elliot Park is a neighborhood within the larger Central community in Minneapolis, MN, United States. It is bordered on the north by the Downtown West and Downtown East neighborhoods, on the west by Loring Park, on the east by Cedar-Riverside, and on the south by Phillips. Its official boundaries are 5th Avenue South to the northwest, 5th Street South to the northeast Highway 55 to the east, the Interstate 94/Interstate 35W commons to the south, and 4th Avenue South to the west. The neighborhood occupies both the Downtown Minneapolis street grid (running parallel to the Mississippi River) and the South Minneapolis street grid (running north-south and east-west), creating many triangular street corners where the two grids meet. Once the home of some of Minneapolis's wealthiest citizens, Elliot Park has recently begun a gentrification process that is returning the neighborhood to a popular place to live in Minneapolis. Elliot Park is one of Minneapolis's oldest neighborhoods, with plots set for housing as early as 1856. It was close to industrial developments on the nearby banks of the Mississippi River, which made it a popular settlement for early Swedish immigrants. The namesake for the neighborhood is Mr. Joseph Elliot, an area physician, who donated his farm land to the city in 1893. This land is the site of the current Elliot Park, and another generous donation of Mr. Elliot resulted in the founding of Steele Park - these were the city's first two parks. It began to rise to wealth near the end of the 19th century, as Downtown Minneapolis began to experience rapid growth. The neighborhood at that time had the city's only two parks, which made it a fashionable area to live in. Several large mansions sprang up along Park Avenue. During the next twenty years, as the city began to grow more and more quickly, the character of the neighborhood began to change. The need for higher concentrations of people transformed the neighborhood into an area of three and four storey brick apartment buildings. Of these, the Rappahannock Condominiums are among the oldest in the city. Included are boston-esque brownstone buildings that connect Elliot Park to the core of downtown Minneapolis. The area began to decline in wealth in the mid-20th century, as the high housing density attracted lower income families. The construction of the interstate system resulted in large areas of the city being gutted, and between 1950 and 1970 the population declined by almost 54%. The freeway construction also resulted in the relocation of several area businesses, which changed the character of the commercial sector, and resulted in a much higher transient population. The neighborhood's historical contribution to Minneapolis remains significant. Two of the neighborhood's buildings are on the National Register of Historic Places: The First Church of Christ, Scientist on 15th Street and the Hinkle-Murphy House at 619 S 10th Street. The neighborhood has been home to North Central University since 1936. By the turn of the century, the neighborhood has begun to quickly gentrify, with numerous, high priced luxury condos enriching the neighborhood's borders with the Central and Downtown East neighborhoods. The additions of Grant Park and the Skyscape condominiums have created a sudden increase in the young professional population in Elliot Park and has increased the appeal of Elliot Park as a downtown hot-spot for professionals seeking a cosmopolitan lifestyle. These additions, combined with the expansion of the Hennepin County Medical Center, have increased the attention on Elliot Park as a neighborhood undergoing significant positive redevelopment and gentrification. Charles Schulz, cartoonist and creator of Peanuts, who resided at 919 Chicago Avenue (now demolished). J. Paul Getty, businessman and industrialist, who resided at 624 S. 9th Street. ^ "Elliot Park neighborhood in Minneapolis, Minnesota (MN), 55404, 55415 detailed profile". City-Data. 2011. Retrieved 2013-11-12. ^ "Minneapolis Neighborhood Profile: Elliot Park" (PDF). Minnesota Compass. October 2011. Retrieved 2013-11-12. This page was last edited on 27 May 2018, at 22:03 (UTC).